I did not recognize them. 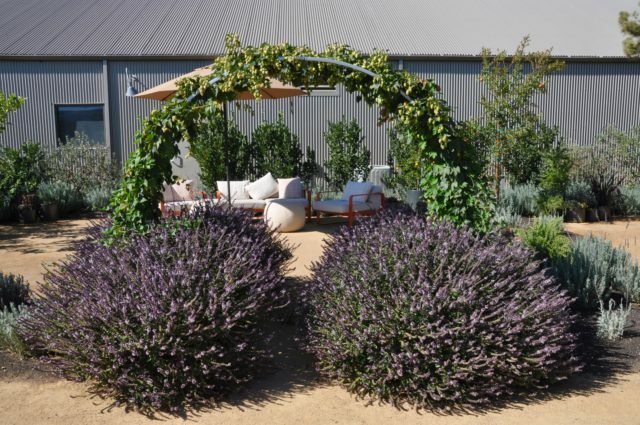 Large, rounded plants with wands and wands of tiny lavender blossoms, hundreds of them. Absolutely alive with bees. I have never seen so many bees in one place, other than around a beehive, like the hive in my own yard. The bees were crazed for these plants. What were they? I’m pretty good with garden plants. I know what grows here in Northern California. I recognize most plants by sight and the majority by name, including, often, the Latin. This one stumped me. It looked familiar, but unfamiliar. An older woman joined me in admiring them, in being mystified by them. We studied and guessed. A type of salvia, maybe? No, that wasn’t right. A few years back I stopped caring about my garden. I ignored the weeds growing in our rows of hillside lavender. I let my perennial garden get overtaken with ivy, wild blackberry and borage. I barely got a few tomato plants in by June last year. Two winters ago, my bees disappeared and I didn’t replace them in the spring. I let my garden go wild. I wasn’t sure what had gotten into me. I had gardened through the busiest years of motherhood. Chris and I installed three different gardens at three different homes, with babies, toddlers, young children underfoot. Three of those, too. I would set up the playpen in the backyard during the short time I could get away with it, and a few months later resign myself to digging and watering while also keeping an eighteen-month old from plucking all my tomatoes while saying ball, ball, ball. I spent years dragging children through nurseries, talking about Busytown or Swan Lake or Pokémon while loading up my wagon with plants. I managed to get my beans and zucchini planted in between baseball games and spring ballet recitals. Who was that woman, and how did she do it? A few months ago, I read an article in Lena Dunham’s Lenny Letter that got under my skin. I love the Lenny Letter—its dedication to feminism, progressive politics, the arts. But this one rankled me. It was an article by the actress Gillian Anderson and her friend Jennifer Nadel, in which they shared their thoughts on menopause. Apparently they’ve written a book called We: A Manifesto for Women Everywhere and are encouraging women to share their struggles, their stories. Shared stories among women. A proposition I can get behind. That is supposed to be some new truth, some finally-revealed story? That’s the same story about menopause I’ve been hearing all my adult-woman life. I think what I always loved most about my garden is how it surprised me. Different every day. 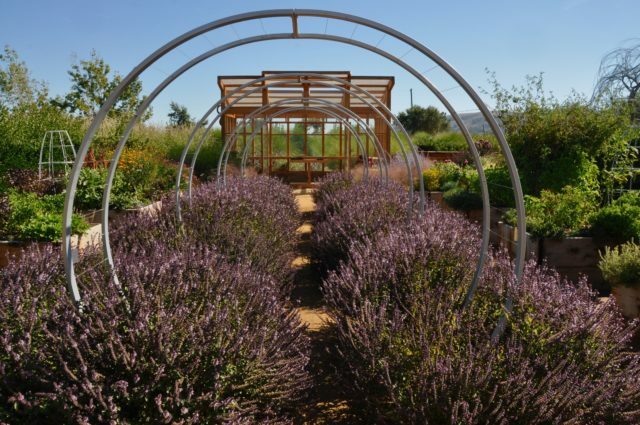 Sure, there’s July, when the beans race up their trellis by the hour and the lavender astounds, a woman sashaying into a restaurant dressed head to toe in purple. But there’s March, too, when the apple tree buds up, sassy in the face of rain, when the oregano and thyme send out their lime-green shoots of possibility. The passion flowers–Maypops–which surprise by popping up randomly, every month but May. The way the garden goes fragile in November, tomato plants wilted brown, weary with green globes that didn’t get a chance. The clematis blossoms turned to bird cages. Never what it was the day before. Menopause surprised me by showing up early and without much incident. Missed period at forty-eight; the full year of misses by forty-nine. Not much else except for a frustrating accumulation of weight throughout my forties, although I ate pretty healthy and exercised. That derailed me a bit. Took a few years of tinkering with my diet—less pasta and bread, more protein—and learning to lift heavy weights. And sometimes when I drink coffee in the morning, I find myself peeling off my sweatshirt. Still, menopause did not hit me like a freight train. It did not affect every aspect of my life. The cloud that makes us so willing to nurture others. While tending gardens. Keeping bees. So that was why I’d stopped caring about my garden. I’d stopped wanting to take care of things. It was interesting to understand that. Still, I didn’t care. I let the weeds do their thing. The year I turned fifty was also our last year homeschooling—after twenty years. I had loved homeschooling. And it wasn’t just a nurturing thing—I’m not the sort of generous mother who could have put in all those years if it hadn’t stimulated me intellectually as well. But I was feeling a shift. My writing, which I’d been working at in fits and spurts since before motherhood, began banging against my ribs with a new urgency. I wanted more time for it. I wanted to lose that taint of amateurism. I wanted to write work that mattered. It was a powerful feeling, both frustrating and exciting. But it did not feel like being hit by a freight train. It felt like the beginning of something. That afternoon last September, Cornerstone Gardens, Sonoma. 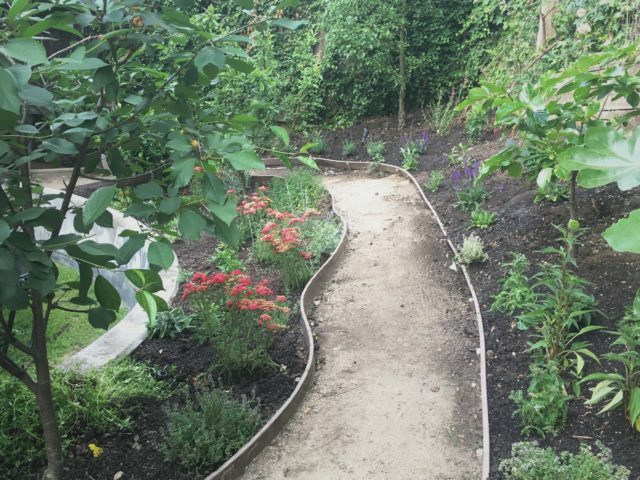 Chris and I followed the bees through an arched allée of those mystery plants into a garden that mesmerized me. Waves of coneflowers and herbs. Scabiosa and yarrow. Almost everything edible or medicinal, like I’d always dreamed of for my own garden. I took photos, noting how the designers repeated plants, combined them in surprising ways. I looked up the designers at home. Homestead Design Collective. Two women from my own neck of the woods. I checked out their books—one available, one I had to wait for—scrolled through their Instagram feed, giddy over plants like I hadn’t been in years. I made lists and plans, mad with excitement. Why hadn’t I heard that other version of menopause earlier? The Christiane Northrup version that calls it the time when a woman becomes “queen of herself”? Why hadn’t I read that when I was in my forties? Why hadn’t I heard that story? 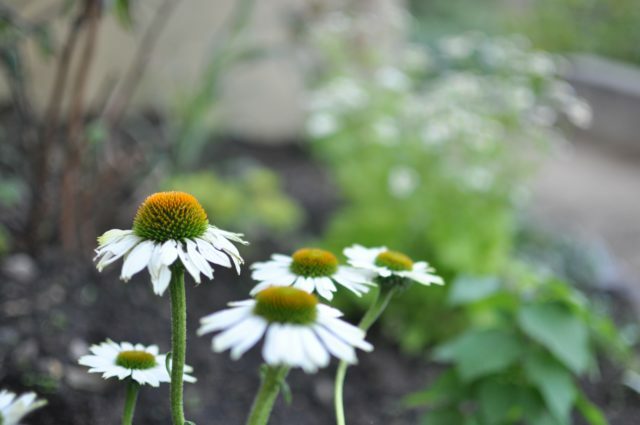 A few weeks after our trip to Cornerstone, I began with the small garden near our front door. Dug in plants I’d never considered before. 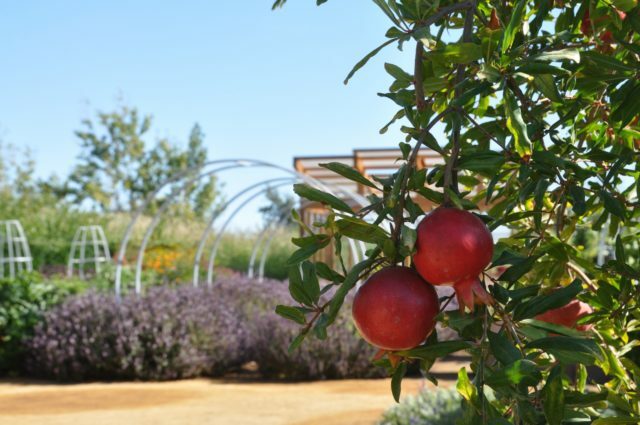 Pineapple guavas espaliered against the foundation, blueberries for winter structure when the perennials die back. Anise hyssop, feverfew. I’ve loved coneflowers since my gardening beginnings, but always dotted them in here and there. Now I planted a small mass of them. Little mounds of green, a few with blossoms. I imagined them a meadow. I understand that I’m lucky. I don’t know why menopause did not hit me like a freight train, did not affect every aspect of my life. Healthy living? Avoidance of birth control pills? Good genes? Plain good fortune? It isn’t just me, though. I’ve talked to other women who have passed through menopause feeling change but not upheaval. When we share our stories, we always express surprise that it hadn’t been harder. And then our surprise that another woman felt a similar surprise. In May, Chris and I took on the backyard. Cleared weeds, pulled out plants that weren’t working. Spent a weekend breaking up hillside clay with shovel and pickaxe. Dug in herbs and agastache, scabiosa and yarrow—and pot after pot of coneflowers. A row of small chinotto orange trees in terra cotta. We got our tomatoes in early, along with rows of padrón peppers, our favorites. Costata Romanesco zucchini and climbing haricot verts. Oh, and an allée of the mystery plant, which I finally found named on a sign at the gardens: “Mountain Magic,” a flowering form of basil. Basil! Of course! I hadn’t recognized it, after a gardener’s lifetime of pinching off basil blossoms so the plants wouldn’t die. I had to visit several nurseries to track down some plants of my own. 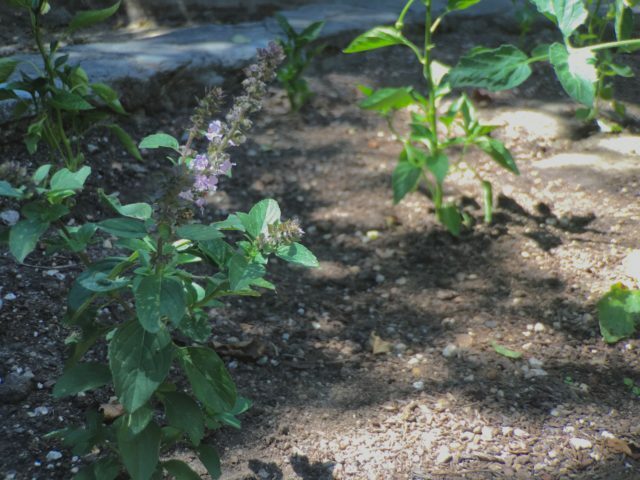 Before visiting that garden, I had never heard of flowering basil. It’s an infertile form of basil, meaning that it doesn’t make it own seeds. Which is what makes the plants so astoundingly abundant. Regular basil plants have a single cycle, a single goal: flower and die, which is why gardeners have to do all that blossom-pinching. Not so with flowering basil. It just grows and flowers, grows and flowers, attracting bees in clouds. The plants are both infertile and beautiful. My flowering basil plants are still small, each bearing just a wand or two of blossoms. Still, the new bee colony I installed this spring is growing like crazy, and there’s almost always a girl buzzing by, checking out my baby basil plants. I know because I’m out there a lot. Things have settled. I’m back in my garden. I wondered: if the plants don’t make seeds, how do they reproduce? How do you get more flowering basil? By propagation, my research tells me. By taking cuttings from a mother plant, and rooting them in water. By sharing pieces of oneself, so they can root elsewhere. I suppose that’s what we do when we share our stories too. So wonderful. Exactly the kind of menopause story I want to hear, and live. I can’t wait until your basil is ready to propagate. As I read, I was thinking – ooh, maybe she’ll share seeds! But we’re moving beyond the time of seeds, and into the time of clippings. Aw, Molly. I love how you take my metaphors and run with them. Yes. I can’t WAIT to give you cuttings of my basil. Thank you for this, Tricia! I’ve been wondering how your journey is going. It sounds like you are making many new discoveries among the garden beds. You give me hope that the transition to menopause isn’t all bad. Yay! Thanks so much for reading, Jennifer! It’s so nice to see you here, since I don’t get to see you across the circle every week. And yes, I think there can be a lot of good in this transition! xo. Oh, Lisa, it means so much to have you reading along, and saying hello here. I’m so glad that you liked this piece. And to think that once upon a time we were 20-year-olds selling knives and food processors! You and Clare and I really need to get together. xo. Thanks so much for reading, Emily, and for saying hello! Lovely piece of writing and so timely. I love how you weave all your thoughts and readings and life itself together. Life is not always tidy and neat and your reflections give it permission to just ‘be’. I wonder how my family’s homeschooling journey will be after I hit menopause, since I am not there yet though old enough to be over it. My youngest just hit double digits and I need to stay on my game for him and his brother for another 10 years :). More relaxed for sure, this time around but I do wonder how menopause will alter my/our journey, hopefully in the best ways of course. PS, your reference to Busytown so brought back memories! Did you read a lot of Richard Scarry books too? I was still going through perimenopause/menopause during my last years homeschooling our youngest. And it was fine. I was definitely feeling the call to write more, and I did that–which gave him a bit more freedom, which he was ready for too. I didn’t really understand why I was ignoring my garden–until I read Christiane Northrup’s book a bit later–but now I can see that I was probably intuitively letting go of the “taking care” that didn’t really matter, and holding on to what still mattered, like supporting my kid. I feel like yelling “winner winner chicken dinner” right now, which is not really appropriate given you don’t eat chicken and the value of this is way beyond a chicken dinner. I guess what I’m saying is that this is triumphant and makes me want to shout in celebration. Thanks for reminding us that we get to write our own stories. I’ll take the chicken dinner if I can have some biscuits! Yes, we get to write our own stories, and even better: We get to write them together! This is a balm for my soul. I turn 40 in a few weeks and have been wrapping my mind around the implications of this next stage. You’ve so beautifully put words to so many of the inklings that have been taking root in my mind. Thank you for this. I’m so happy it’s helpful, Nanette. My advice is to read up now so you know what to expect–it will make it so much easier to navigate. I found Christiane Northrup’s book to be very helpful and encouraging. There are some really fantastic aspects of menopause, and you want to hear that side of the story too! Well, Janet, one benefit of having kids as young as we did is the luxury of going through menopause when our lives are calmer–unless you’re like me, having kid #3 ten years after kid #1. Haha! One day we’ll be empty-nesters too. I’m so happy that my writing provokes good thinking. We have so much to talk about in July! Thank you for being such a loyal reader. It means a lot to me. xo. 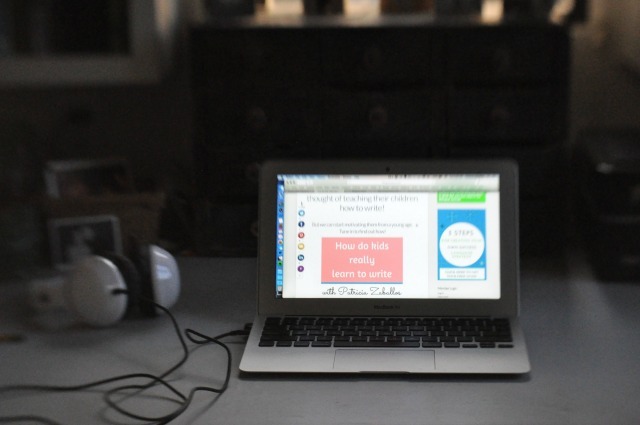 I haven’t been by in a while but someone just stopped by my blog and said they were beginning a journey into homeschooling with their 13 year old and you are the first person that jumped into my mind. 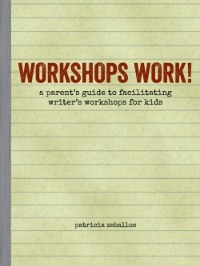 I have steered her in your direction with emphasis on your Workshops Work publication (which I love). Thank you for sharing and being so generous with your time and talents. We all become richer from it – you from the sharing and reflecting and responding, and us who read and learn and devour and enrich ourselves and our kids by standing on your shoulders. You are a gift! Sonya, I am always delighted to hear from you–and to see what amazing things you are doing in the world of education! And it looks like there is a baby #2 in your life–congratulations! Thank you for steering your reader in my direction. I hope she finds something useful here. 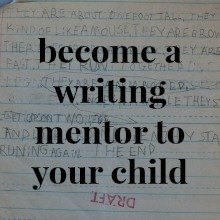 One of these days I will have a homeschooling memoir to share, and I won’t stop working until I get that thing done. 🙂 Best of luck in all you do. I can tell that you are a light in the lives of many. xo.